London's West End is just a short hop on the bus or tube. You're a stone's throw from Harvey Nicks and Harrods is just down the road. Guests love to stay at The Berkeley for the relaxed sense of luxury and contemporary, innovative service experiences we offer. From the Berkeley Fashion trunk we can have delivered to your room to our rooftop Winter cinema or the Burberry trench coats in your wardrobe we try to charm and surprise at every turn ! There is something for everyone at The Berkeley , whether you want a gourmet two Michelin star dining experience at Marcus , try the latest cool cocktails in our recently redesigned Blue Bar or experience our legendary fashionista Afternoon tea – Pret-a-Portea where all the cakes are inspired by the latest season's fashion collections. We offer a unique rooftop pool overlooking Hyde Park and Knightsbridge where guests can relax or enjoy various aqua fitness classes as well as rooftop hula hooping in the summer months. We offer a variety of Bamford treatments from signature massages to facials as well as manicure and pedicures. 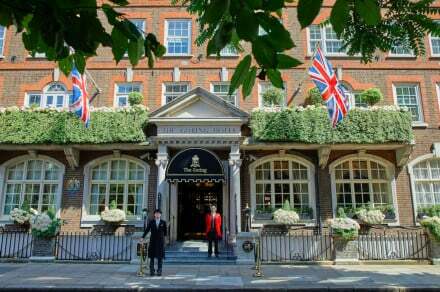 Located in the heart of bustling Knightsbridge, the hotel has a wide selection of restaurants and shopping with Harrods and Harvey Nichols a stone’s throw away. 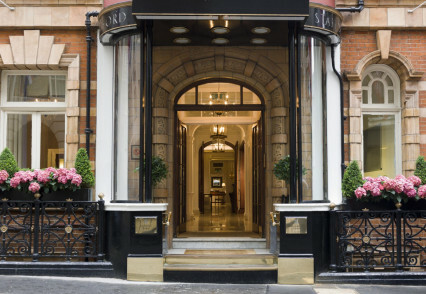 Additionally we are next door to two of the great Royal Parks, Hyde Park and Green Park, as well as being situated within Belgravia, providing a quiet English village feel amidst the capital, with cobbled streets, bespoke stores and galleries. We have something for everyone with our speciality Berkeley homemade muesli, and our pasties and breads all freshly baked every morning in our Pastry kitchen. We also offer a varied buffet of meats, cheeses, pastries and fruits plus a selection of cooked options. International options such as Japanese are also available. Yes we offer all meals – breakfast, lunch, afternoon tea and supper. We have our newly designed Collins Room where our fashion themed afternoon tea, Pret-a-portea is served, created by our Head Pastry chef Mourad Khiat Additionally, Marcus Wareing’s two Michelin starred Marcus at The Berkeley offers modern British fare for lunch and dinner. Our concierge are also well versed in all the newest local restaurants and can pull strings to get a great table for the wide selection London offers from sushi to Indian. Our most popular room types currently are our brand new terrace suites by John Heah as they offer a relaxed, spacious environment with a residential feel as well as outdoor terrace space with views onto neighbouring St Paul’s Church. The attention to detail in the décor, the location, and the views give the guest a sense of calm whilst being situated in the heart of London. They also have particularly luxurious bathrooms. We are very family friendly and can always offer extra beds or cots for children. We are also developing our rooms so that connecting rooms are widely available throughout the hotel to allow for travelling families to have the utmost comfort and convenience. We offer various toys and games for children upon arrival and our pool is also a big draw where we have a number of fun inflatable toys for them to enjoy. We are currently launching children's masterclasses to learn how to make out Pret-a-portea biscuits with our pastry chef in the bakery and come spring 2017 we will be working with top children’s party planner Sharkey & George who will be putting some London-centric activities together for our smaller guests. The rooftop pool overlooking Knightsbridge is magnificent..